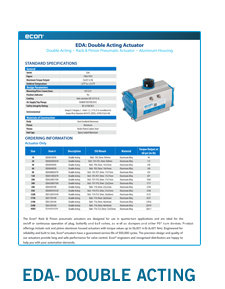 The ECON double acting pneumatic actuator is designed to include a compact rack and pinion design and the use of aluminum parts. These actuators are lightweight and compact. Apart from the position indicator, all versions are without any external moving parts. This makes these actuators safe in operation, easy to install and virtually maintenance-free. This actuator can also be converted to a spring return application.